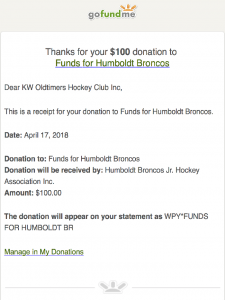 Donations - Kitchener-Waterloo Oldtimers' Hockey Club Inc. 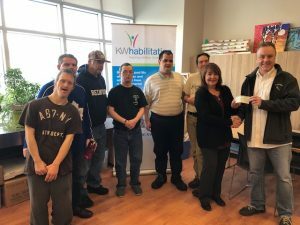 The Kitchener-Waterloo Oldtimers’ Hockey Club considers itself an integral part of the Kitchener Waterloo communities; and has for many years made donations to the communities and to other not for profit services. Listed below are a sample of past donations. On behalf of the Club, Steve Lyon, our Donations Director, made a presentation to KW Rehabilitation Services of our recent donation to their project of creating a walking trail around the organization’s “My Farm” property in Waterloo. KW Oldtimers will be acknowledged as a significant donor on the signage leading to the trail and in various reports and media. 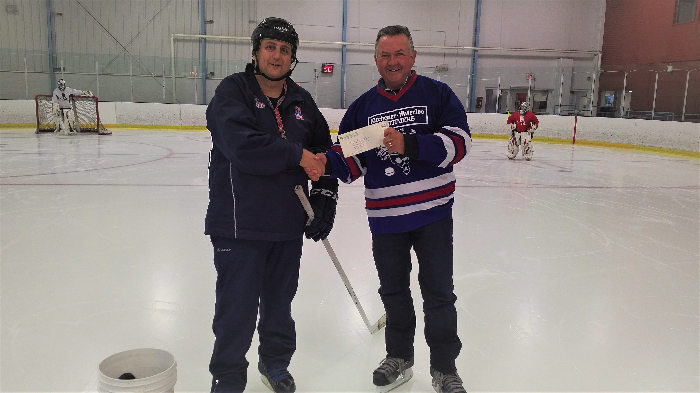 On October 25 Chris Gehan was on the ice at Sportsworld to present a cheque for $2000 to the Pioneer Park Panthers Hockey Club. Accepting on behalf of the school was Steve Sanderson. 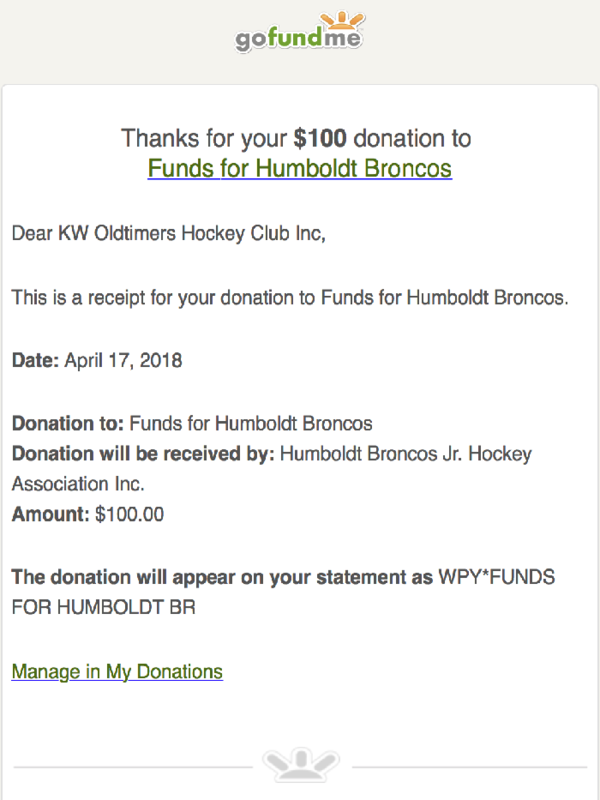 He expressed gratitude for the support of KW Oldtimers Hockey in making it possible for close to a 100 young people in their elementary school, boys and girls, to get experience with hockey. Their club is also supported by a grant from the NHLPA that ensures there is equipment for all the students. These students would likely not otherwise have exposure to hockey on a purely financial basis and it was evident by the excitement they show on the ice that this is very important to them. Steve advised that included in their numbers are a couple dozen kids who are recent arrivals in Canada. We should feel positive that we’re holding a role in spreading the hockey message! 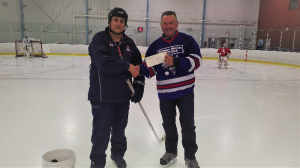 KW Oldtimers Hockey presented a donation of $2500 Dec 3, 2017 to the Pioneer Park Panthers Hockey program. League VP Chris Gehan joined the students and their coaches on the ice for a brief presentation. It was wonderful to see young people, about equally boys and girls, being introduced and coached through skills, many of whom would not have an opportunity to be exposed to hockey without support such as we provide. Our contribution goes a long way to help cover ice time and equipment costs (gear is available to any student who needs it, they check it out for the season and return it for the next year). We do good things, and all members should be proud of that. All requests for financial sponsorship or donations need to complete the application and forward it to the Chair of the Donations Committee.